Let’s step back a minute. When I was around 12 years old, my brother and I were given a 1933 World Series New York Giants signed ball and program. My great-great-great-uncle played on the team and my grandmother secured the ball from a relative. Until recently the ball had been sitting in a case getting dusty so I finally decided I should frame it up with the program. I wanted to get the ball authenticated though. I know the signatures are legit but it’s still nice to have a letter of authentication from a reputable company for display. I found that the top two companies for autograph authentication services seem to be PSA (Professional Sports Authority) and JSA (James Spence Authentication) after a little research and speaking to a local sports shop. I ended up sending the ball off last week to PSA and plan to get it framed up when it comes back within 10 days or so. Well PSA also grades a lot of cards. I remember checking Ebay every once in a while and noticing that graded cards are going for a lot more than loose ungraded ones online. So I then started researching some grading companies. Apparently, the last few years, there has been a resurgence of collecting due to these grading companies. I just recently started collecting some of the cards I could never afford as a kid that are graded by PSA or BGS (Beckett Grading Services). Those are currently the only ones I am interest in. That gem mint 10 Ken Griffey Jr you see at the top goes for about $300 Now $400+ as of 08/17 on Ebay. The same card mint-looking condition but loose and ungraded goes for $15 – $20. Just for reference, a PSA 9 Mint card goes for about $45 $70 as of 08/17. So there’s a big demand for these graded cards but the condition and rarity is everything. There’s also a population report on the PSA website that’s available for free. You can see here that there are currently 58,894 Ken Griffey Jr 1989 Uppderdeck cards that have been graded. There are 2,150 PSA 10’s and 18,874 PSA 9’s. That’s still a lot. It can get a little confusing though. BGS, for instance, assigns 4 different grades and an overall grade. You can see all grades including centering, surface, corners and edges which are each assigned their own grades. A BGS 9.5 is called Gem Mint just like a PSA 10 and typically sells for about the same prices. However, there is a BGS 10, Pristine Mint, that can sell for even more. 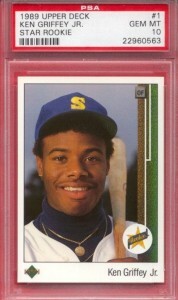 The same Ken Griffey card in BGS 10 can go for up to $2,500 since they are much more rare than a PSA 10. See below what they look like. The requirement, I believe, is a minimum of 3 10’s and a 9.5 to be called a “perfect” Pristine 10. There’s also registry sets where you can collect specific groups of cards and keep track. The top registry sets from other collectors are also posted. I’m currently working on a Nolan Ryan Topps set and a baseball hall of fame post-war rookie set. That HOF set is going to take a LONG time to complete. It includes cards like the 1951 Bowman Mickey Mantle that goes for thousands even in low grades. I currently just have 3 cards in the 85-card set. There’s currently 182 people working on the HOF set and I have a ranking of 157/182. 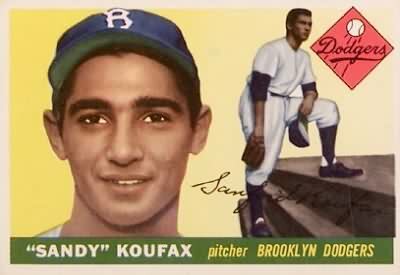 My prized card right now is a 1955 Topps Sandy Koufax rookie card graded PSA 7 currently valued around $1000. **Update** Here we are in June of 2017 and that same card is selling for over $2500 on Ebay. This is one HOT card! Now let’s look at a Nolan Ryan card I bought a few years ago and what it’s going for today. I got the Ebay “fever” and actually purchased a few cards a couple of years ago. I haven’t until recently started buying more. This was spurred by the World Series signed baseball and memories it gave me as a kid. The last couple of years I did take some snapshots and record selling prices for some cards that I either bought or was wanting to buy. I’m attempting to find trends and see how much certain cards are appreciating. 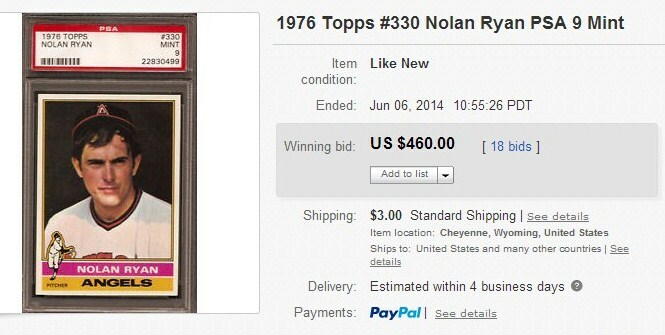 Take the 1976 Nolan Ryan graded a PSA 9 Mint for example. Here’s a snapshot of what the card was going for in 2013 and what it’s going for about a year later. These are not asking prices by the way, these are actual sold auctions. This card is up a whopping 64% in a little over a year. I don’t know about you, but that’s a heck of a return! Here’s one more example of the Nolan Ryan 1968 Rookie Card that’s graded a PSA 8 NM-MT. I don’t have a snapshot but I recorded two selling prices back in 2013. The first sold on 07/10/13 for $1000 and the second sold on 07/11/13 for $1350. I know that’s a big variance in just a day but one was a buy-it-now auction so someone may have overpaid just a little for the second one. Either way, they are both well ahead today. Here’s a shot of a recent auction for the same card that ended in June. Notice that the auction sold for a price of $2,150. Let’s take the average of last years’ auctions and say the price was $1175. From $1175 to $2150 is an 83% gain in just under a year and a half! Here’s one more example of a Reggie Jackson Topps Rookie card graded PSA 8 in both auctions. By the way, that Reggie Jackson rookie above in a PSA 10 sold at auction in 2012 for over $100k in the Dimitri Young Collection. I compared a very recent selling price to one 3.5 years earlier. The selling price for this HOF rookie card increased from $535 to $905, a difference of $370 or a 69% gain. That’s an annualized gain of more than 15% per year. No too bad! As you can see, the market for the right cards can be outstanding. I obviously have a lot more research to do but sticking to hall of famer’s rookie cards could turn out to be a decent investment. So what do you think? Do you collect sport cards and if so, what is your prized card? Is the rapid increase in prices caused by the baby boomers buying up all of their toys and collectibles they had growing up? These cards don’t pay dividends but they could produce some nice capital gains down the road. Either way, it’s fun and I don’t think I’ll lose any money on these purchases. It’s just another form of entertainment for me. My former boss is a huge baseball card collector. He is one of those people who would tell the same stories almost daily, so I heard at least 300 times how his wife would not allow him to get a loan out for un-opened wax packs back in like the 70’s, Whatever year was Micky Mantle’s rookie year. Anyways, he kept saying how much money he would have now if his wife would have let him get the loan out for it. I did point out a few times that he wouldn’t have that much money because he just collects and doesn’t sell. I don’t think that point ever sunk into his head :). Kipp recently posted…Can a Nissan Leaf Save Me Money? Thanks for the story, that’s too funny! The owner of my local card shop told me about a story in the 90’s where he had the opportunity to buy a case of 1986 fleer basketball cards, that’s the year with the Jordan rookie card. He bid $50k and was outbid at $65k. Now one pack goes for over $500. Take 24 boxes times 36 packs per box times $500, that’s almost $500k! I’m sure every collector has those stories. Haha, that’s a good point. I just usually collect for a little while and end up selling. I then start collecting something else. I try not to get too emotionally attached to anything. Sports cards are dead money. Once the baby boomers get old enough to the point where they can’t remember their youth, these items will be in even less demand. Go to any card show or shop the few customers are grey/white haired old white guys. When they die off, who steps in to replace them? I am only in my 30’s and had cards(nice ones) mostly from the 50’s to the 80’s. I tried selling them in my area with no luck. Ebay is a buyers market, so no luck there. I actually had to go out of state while on vacation to sell them, even then it was only for less than half of the book value. My advice is to you is not to buy anymore, just because the price is low, in order to flip them later on in life. Buy them because you actually like them. You are a smart guy just buy what you know(stocks, real estate, gold, etc. ). Those are classical investments, sports cards are childish at best. I’m not expecting to retire off of baseball cards. Some of these cards have been great investments over the last 10 years, just look at the Dmitri Young auction link I posted. Plus I’m just doing this for fun. The 80’s cards and up were so mass produced that it’s difficult to get much money for them unless they are extremely rare. I did buy a Nolan Ryan card that was a special insert and 1/1 population from the 90’s earlier in the year, but I actually liked the card. I paid $300 for it and kept it for a few months. I posted it for $1000 on Ebay and someone bought it. I know there is some money to be made but I certainly won’t be relying on income from this for retirement. I am a pro at Ebay though, I’ve bought and sold items even in college to make some extra cash for beer money. But like you mentioned, I’m just going to do it for fun and because I enjoy it. If I make some money in the process, that’s great. If not, then I know the risks. Also, the baby boomers won’t be dieing off very soon. The oldest are about 68 and the youngest are just 50 years old. They are just starting retirement. They have a lot of spending left to do. Don’t worry, 95% of my investments will be in traditional areas like equities and real estate. There will always be someone willing to pay for nostalgia. ILG recently posted…August Portfolio Updates – It’s been a while! I’ve heard of the game and would probably like it. I don’t know anyone that would play that game with me though lol. The same card shop down the street from me does sell those types of cards. I know some are rare and valuable and, I’d imagine , the higher graded ones are even more valuable. I tend to grow out of things also but I usually keep them. I’m a little bit of a pack rat. I agree with you though, someone will always pay for nostalgia. IMO. invest in Magic the Gathering cards. You can buy a box when they first come out, and typically make money off it a few weeks later. On average they accrue value over time, and there’s far more cards that are valuable. The black lotus card is worth around 100k. My friend’s pretty ordinary competitive deck is worth $500. Interesting post Brent! It seems you have been making some decent money on eBay. I was enthusiastic NHL hockey card collector as a little boy and think I still got some of the rarer Wayne Gretzky special cards. I’ll have to take a look if they are worth anything on eBay. Good luck with your little side business! I’ve been buying but mostly selling on Ebay since 1999 at least. I’m pretty good at picking up things at a good deal and reselling for a profit, although sometimes small with the Ebay/Paypal fees. I don’t know much about hockey but everyone knows of Wayne Gretzky. I’m sure his cards are valuable, especially high quality examples. This is just something I do in my spare time, I don’t think it would ever be a full-time business. I think that collecting in general is fun. Make money while you do it (or years after) is the added bonus. i have been a baseball card collector now for almost 50 years.i have owned several baseball card stores in new England .i recently have sold off my stores.and kept over 75% of the cards i had in stock.and now i sell on eBay and other web sites.and the business i do is phenomenal .i have tons of ungraded older cards as well as the high end newer stuff.i have found that what sells the best these days is basketball cards.the market for raw and ungraded hoops cards is under valued.and i have made a small fortune on buying these cards.and then sending them off for grading.and my return on them is much better than any other investment out there.forget gold and silver,and petroleum,and even real estate they are not a stable investment in my opinion.so buy cheap,grade them and sell them and laugh all the way to the bank…..
Yeah, laugh all the way to the bank reminds me that a friend recently said that when the cards are booming again I’ll get rich! I think in the future, today’s short printed (serial numbered, jersey, auto, etc.) Will be highly sought after. Imagine if these cards were of iconic players from the 1980’s of Strawberry, Mattingly, Michael Jordan, Barkley, Ewing, Joe Montana, etc. They would go for a fortune. Seems like a great investment. And ofcourse real collector items only become more valuable over time. But you have to make the right choices, and also you must know when to stop. Because when the value gets too high, are there still people with that much of money to pay for it. Only a small group of collectors remains then, and they will ofcourse understand the value perfectly and look for cheaper alternatives. It’s interesting to learn that the sudden surge in the collection of cards online is due to the grading systems like PSA and BGS popping up. That’s surprising to learn since I’ve been thinking of collecting football cards for the longest time and they weren’t even a thing before. It sure does make collecting these graded cards more interesting though since it’s like investing in stocks and the likes. Hopefully, I am not too late for the game. Thanks! Baseball cards work better than some collectibles because there’s a better degree of cross-generational interest in them. Baseball is definitely not as big as it once was, but kids still take an interest in players their fathers and grandfathers watched. My son is looking into getting into sports memorabilia and collecting rare cards. It seems like if he started now, he could have a good collection when he’s older. It was interesting to read that PSA graded cards tend to sell for more money.